Browse: Home / PhpSploit v2.3.0 (in Development) – Stealth post-exploitation framework. + Remove deprecated lcd and lpwd commands. + Fix some small bugs and documentation misspells. + Fix issue #6 (*_proxy env var handling through http tunnel). + Add full backward compatibility with older phpsploit session files. + Rewritten the whole PhpSploit framework in python 3 with new skeleton. + The system have been renamed into run. + Add corectl command, which includes some core debugging utils. + TEXTEDITOR setting has been renamed to EDITOR. + WEBBROWSER setting has been renamed to BROWSER. + The infect command has been removed, its role is now taken by exploit. + The new session command now manages the old load and save commands. + The set command now supplies a new keyword (“+”) for line appending. + Any setting now suports random choice from multiple values, with the new set command’s + keyword, that uses SettingVar class as data wrapper. + The eval command has been replaced by source, more restrictive. + The lastcmd command has been replaced by backlog, more simple. + The phpsploit source code has moved to ./src/ directory. + Plugins path is now available at root directory. 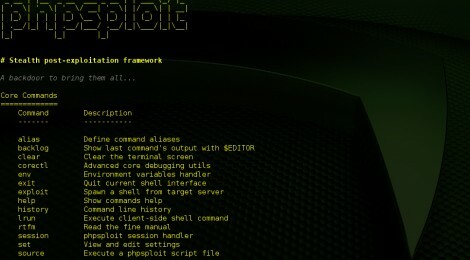 PhpSploit is a remote control framework, aiming to provide a stealth interactive shell-like connection over HTTP between client and web server. It is a post-exploitation tool capable to maintain access to a compromised web server for privilege escalation purposes. + Cross-platform on both the client and the server. ← doork is an open-source passive vulnerability auditor tool.